Your average visitor is only reading 20% of words of any given page. That means your copywriting needs to be cleaner than Mr. Clean’s bald head or you’ll quickly lose their attention. It’s easy to think that with little to no writing experience, you could spice up your businesses sales copy without any help. Do you want to generate more revenue or leads? Then you need to hire a professional copywriter. The benefits are endless: more sales, increased traffic to your website, and they save you time to name a few. Keep scrolling if you want to learn more about why you need a copywriter and how to hire one. Is hiring a copywriter worth it? Hiring a professional writer has direct and indirect benefits. If you work with a great writer, the ROI can be insane. It’s not unheard of for copywriters to bring in hundreds of thousands of dollars for their clients — I’ve done it myself. Let’s take a deeper look at why you need a copywriter. Every target market is different. They have varying needs, ages, incomes, and values. A good copywriter knows how to perform his or her research to understand your ideal customer like the back of their hand. BusinessWire found that market analysis leads to better understanding customers and competitors, while also allowing you to test things, and in our case, sales copy. A good writer will ask a lot of questions about your audience when working with you, such as their pain points, strengths, and demographics. With this information, copywriters will blend into your audience like a chameleon. Their writing will strike the hearts of readers and make them feel enticed to take action. In other words, it makes you money! Are you hiring a copywriter for blog posts or website content? Then odds are that they’re going to have much better SEO skills than you. Google gets roughly 63,000 searches per second. They’re kinda a big deal, and copywriters will help you get a piece of the cake. Remember, a good writer is all about producing results, and blog posts don’t create much results without SEO. They’ll ideally have Einstein level keyword research abilities, and their on-page SEO expertise should make any marketer jealous. If you are looking to get a writer to create website content, always ask what experience they have with search engine optimization. I’d run if they have little to none. I have 6+ years of SEO and I can’t imagine writing content for my clients without it. Articles, e-books, whitepapers, newsletters, and the list goes on. There are endless forms of content to offer to the world. Copywriters understand the importance of variety, and will have the skills to create anything you need. Sure, some niche down on specific formats, but it’s awesome to have a well rounded writer. It prevents you from having to hire separate people, saving you money and time. Imagine you have a copywriter named Bob. He writes amazing blog posts, but suddenly you need a new sales page for a product launch. Bob doesn’t specialize in that, so now you’re on the hunt for a second writer. I’d recommend doing projects will multifaceted people to avoid these situations. The best copywriters have one goal in mind — to make you more money. As I mentioned earlier, there is the potential for astronomical ROI. Heck, even if you get a modest Reuther, you’re still making money on your investment. That’s how you should approach hiring anyone for your business; they’re an investment. It doesn’t matter if they are producing sales copy, designing your website, or handling your social media accounts. It should equate to getting you more customers. Copywriters use strategies to make readers feel compelled to take out their credit cards and purchase right away. They use storytelling to get the audience emotionally invested into the copy, tug on pain points, and hundreds of other tactics. Researching, planning, and actually sitting down and writing copy takes a lot of time. As a business owner, there’s probably a million other tasks you need to get done. That’s where hiring a copywriter becomes so handy. They create the opportunity for you to pour your energy into other business operations. Perhaps your email marketing, customer service, or inventory needs more love. While your copywriter is busy typing away, you can tend to other things and ensure they don’t lag behind. Do you sell metal axles that are placed onto pickup trucks? Or how about dentist chairs? These aren’t the sexiest products on the market, but a copywriter can get your customers jumping up and down to buy one. A copywriter will use the main benefits of your product, emotional aspects related to it, and industry specific lingo to make it jump off the shelves. I believe this to be one of the signs that a writer is truly skilled. Do you like money? Then yes, hiring a copywriter is definitely worth it. But at the same time, there are some things to consider before you go asking for resumes. If it’s low, you’re probably not going to get a writer that’s any better than you. Upwork, mills, and job boards are not where you find talented copywriters. In that case, I would suggest just learning how to write copy yourself. Good writers most likely have their own websites to contact them or can be found at networking events. Would you hire a business consultant for $10/hour? I hope not, and you shouldn’t hire a cheaper copywriter, either. Hiring a talented copywriter is also going to save you hundreds of hours of not having to learn the skill yourself. Overall, if you value results and saving time, then it is well worth the cost. I would argue that every business needs a copywriter. It doesn’t matter if you’re purely online, have a brick and mortar shop, or both. You have some form of sales material. Think web pages, brochures, blog posts, newspaper ads, etc. You can write it yourself, but a professional copywriter will always do it better. You only have a moment to grab the readers attention. If you let that slip, it’s over! A lot of material only needs to be written once, too. Slogans and about pages are examples. If you use landing pages, sales letters, or similar material, you should try hiring a copywriter at least once to see the difference for yourself. Ready to propel your business forward? Great, then it’s time to hire the Shakespeare of your industry. Like I said before, Upwork and those sites should be avoided at all costs. One website I do recommend is WorkingNotWorking. Apple, PayPal, and some of the world’s biggest companies look for writers there. Click the signup button from the top right and choose the hirer option. 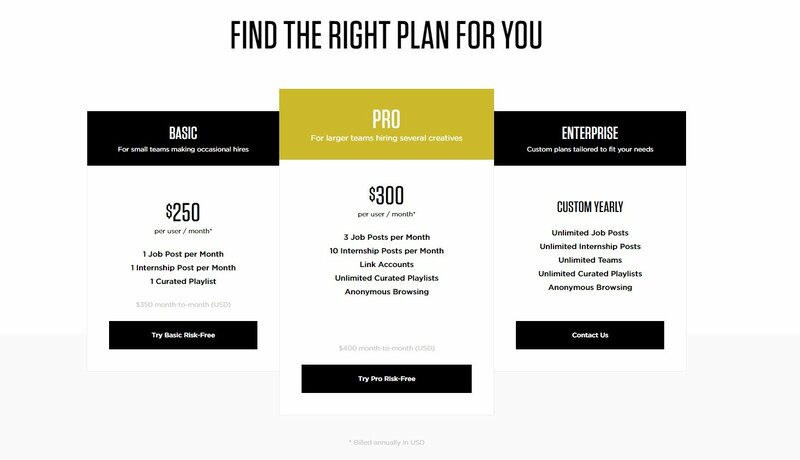 You’ll need to choose from a pricing plan on the next step. I know, it can look a bit steep, but if you’re serious about finding the best of the best it’s well worth the money. Luckily they offer a free demo to test out the platform before-hand. Complete the signup process and publish a listing that details what you’re looking for in a copywriter. The second approach you can take is by using good ole’ Google. 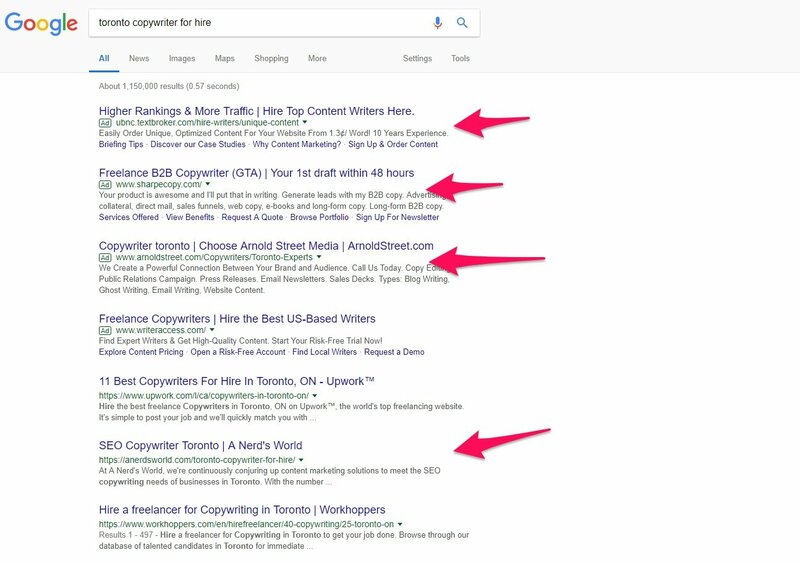 Search for keywords like “Copywriter for hire” and add in some industry or location specific words. This will yield tons of writers to contact. Pitch them with the project you’re working on, your budget, and schedule a discovery call. If you think they make a good fit, flesh out a contract for them to sign and get to work! There are a lot of bad writers in today’s world, so you need to cut through the static. As a copywriter myself and as someone who has hired writers, here’s what to look for in a copywriter. I don’t know about you, but I won’t work with people that have crappy attitudes. Negativity and stubbornness will make working together dreadful, and they tend to refer similar types of clients. One of my all-time favorite books is 48 Laws of Power. It’s a collection of paradigms on business, health, productivity, and success. Rule #10 is “Avoid the Unhappy and Unlucky” and should be a rule to live by when hiring people. If you’re a nice person, you might give a newbie or someone with a small portfolio a shot. I’ve done it and it’s landed me some awesome writers. But if you want the best of the best, always look for a strong portfolio. They should have clients in your industry, relevant work, and hopefully have been writing for at least a few years. You can’t get good at writing without actually writing tons of sales copy, so experience is a must. This only applies to blog posts and web content. Copywriters with search engine optimization knowledge are dangerous. Not only can they produce content that makes people want to buy products or opt into funnels, but they grow your organic traffic, too. It scales together. Think about it. The writer increases your conversion rate, which leads to more sales. But since he targets keywords and optimizes content perfectly, it brings you in more and more traffic over time. Always look for this in copywriters if you need web content, it’s a huge bonus. It’s been proven that we often underestimate how long tasks will take to complete by twice the actual time it needs. When you conduct an interview or discovery phone call, ask how they manage their time and deadlines. You want someone that is productive and won’t delay your projects by handing in a project late. I can speak on behalf of many copywriters when I say that research is a huge component of putting together sales copy. I’ve worked with clients in industries that I’ve barely touched, and had to do weeks of research before writing. A good writer doesn’t need to be an expert in the field, as they can make themselves sound like one, and can find all of the necessary data, studies, and facts to create compelling copy. Ask potential candidates what their research process entails and how long it normally takes.